When Lunar New Year comes around, you can expect a massive migration in China of people traveling home (it’s called the “Spring Festival rush”). For this annual family reunion, the most important (and the biggest) event takes place on Lunar New Year’s Eve. When I was but a wee babe, I remember my family gathering at my parents’ restaurant after closing time to feast on lobster, pork ribs, and more for New Year’s Eve. Back then, I had no clue what we were doing until I grew up, but this annual feast remains my first memory of Chinese New Year even after we switched to celebrating at home. Third Culture Bakery’s co-founder Wenter Shyu also recalls everyone in the family coming home for Chinese New Year (more than 20 people filled his grandma’s house every year) to devour golden shrimp, gift red envelopes and consume/hoard a lot of dumplings. “It’s like the Super Bowl holiday for our family,” Wenter explains. Chef Melissa King laughs when telling me, “I just remember a lot of food, all the time.” Same. On top of a required family feast, families celebrate with centuries-old traditions to bring success with the New Year. For example, red envelopes (typically filled with money) and sweet treats are a big deal for kids and adults alike. Growing up in the Bay Area, Cheryl Quan remembers her grandma carrying around a plate of candies and requiring all family members to eat a piece of candy once they entered the house. King also remembers the red envelopes fondly and explains, “ When I think of Chinese New Year, it’s the red envelopes, or lucky money. The history behind it, my mother explained, is that it symbolized small amounts of money that you could give to children to go buy sweets because sweets symbolized prosperity or good luck.” There was also a lot of citrus fruits — “My grandma always had pomelos or oranges with the green leaves still attached sitting on her counter,” says Melissa. In every culture, certain foods have a special meaning, but according to tradition, it’s especially important to eat the right things at New Year’s Eve to start the year with the most luck you can gather. Unless you’re allergic to an ingredient, you're encouraged to eat a little bit of everything to maximize your good luck potential. Of course, China is large with a vast diversity of regions, dialects, and ethnicities. Families cultivate their own practices rooted in their villages of origin. My family, for instance, always served a seafood dish with a black noodle ingredient called fat choy, and it was because the last word sounded like the “choy" meaning wealth or prosperity. You always greeted family members and family friends on New Year’s when you saw them with the phrase “gong hay fat choy” (“wishing you prosperity”). Phone calls to relatives in China were also required to start with this phrase from both parties. For Chinese New Year, Cheryl's family a special dish full of meaning. 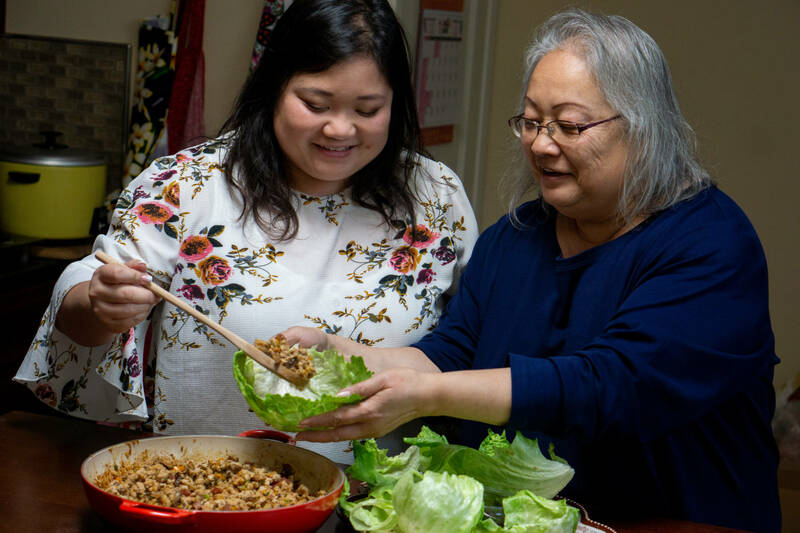 The women in the family always cook together (with Quan’s dad occasionally), but, for as long as Cheryl’s memory goes back — which her mom, Diana, jokes is just about two years — their family has pork lettuce cups every year, but only for the new year, marking it as a special occasion. Each ingredient in her mother’s recipe represents something special and fortuitous that make it an important addition to the menu. Lettuce (sang choy) means “life, prosperity, family.” Water chestnuts mean “unity,” while mushrooms mean “opportunity.” Pork represents“strength, wealth, abundance.” Along with these lettuce cups, Quan’s family prepares a whole chicken (to represent a harmonious and unified family) alongside rice cakes (nian gao) and other auspicious dishes. Melissa’s mother was from Hong Kong while her father moved from Shanghai to Hong Kong at a young age. 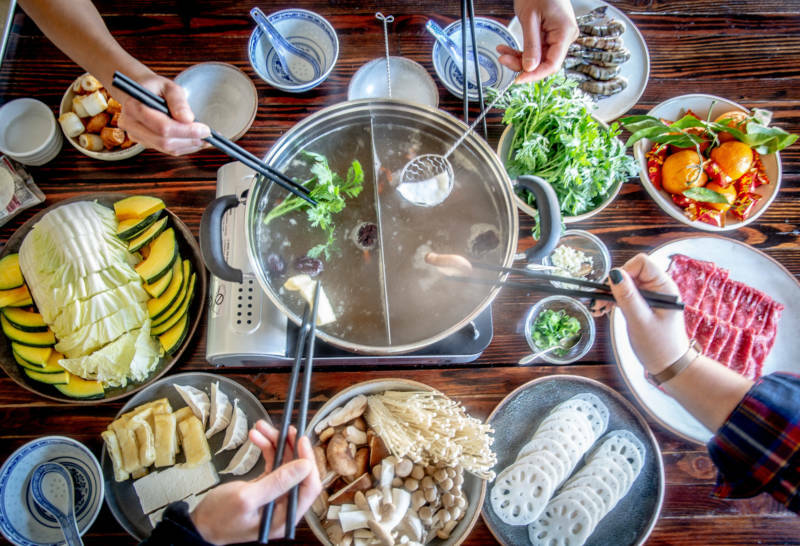 Growing up “in a very Cantonese household” meant their family gravitated toward seafood-heavy feasts, and celebrated Chinese New Year with the family hot pot. 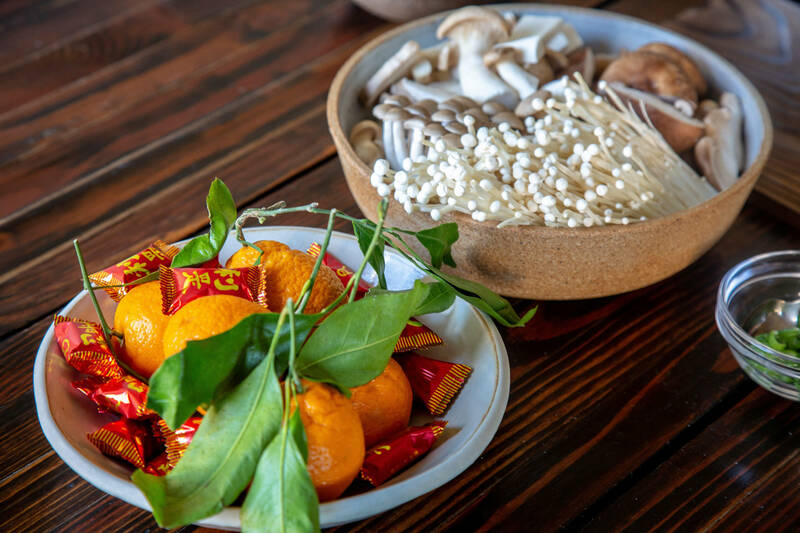 Though sides might occasionally, the staple at their hot pot table was a clear, chicken bone broth with goji berries, jujubes, and ginger made by her grandmother. For Wenter’s family, noodles (long noodles mean long life) and dumplings (the shape represents Chinese ingots a.k.a. money) take a prominent presence since the carb-loaded dishes are what his grandma’s region is famous for. 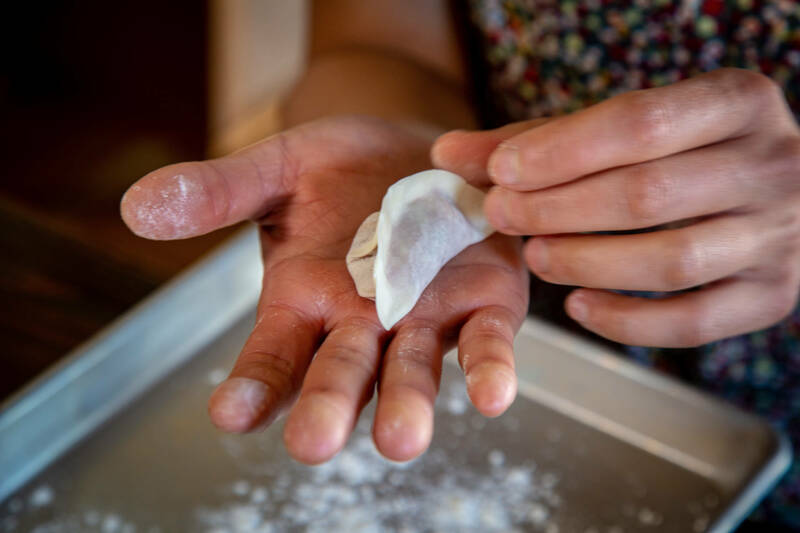 In fact, dumplings are present on nearly everyone’s table, and they are practically always homemade. 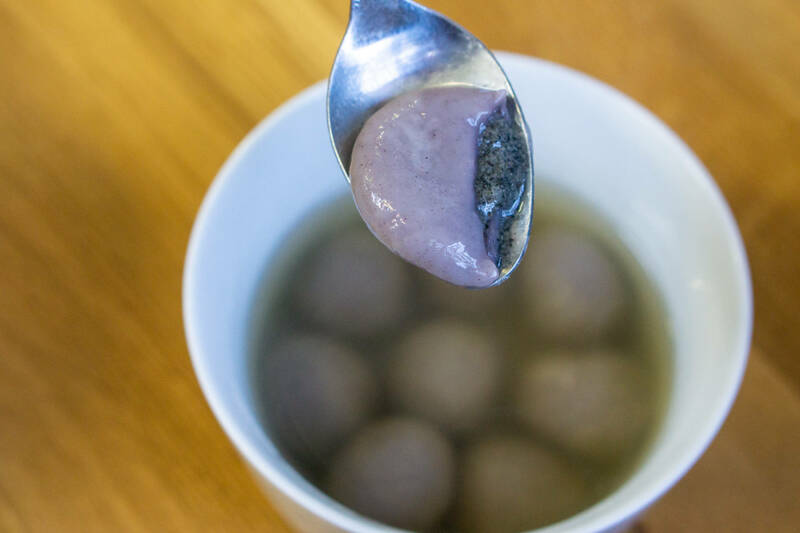 And don’t forget about what I like to call dessert dumplings, aka tang yuan. Wenter’s family always ends their feast with it because, as Wenter explains, “it’s supposed to symbolize togetherness because of how sticky it is. As you eat it, it’s supposed to symbolize how your family will stick together.” And no matter how full you are, you must end the meal with at least one. Wenter usually tries to go home, but he isn’t making it back home for Chinese New Year this year. 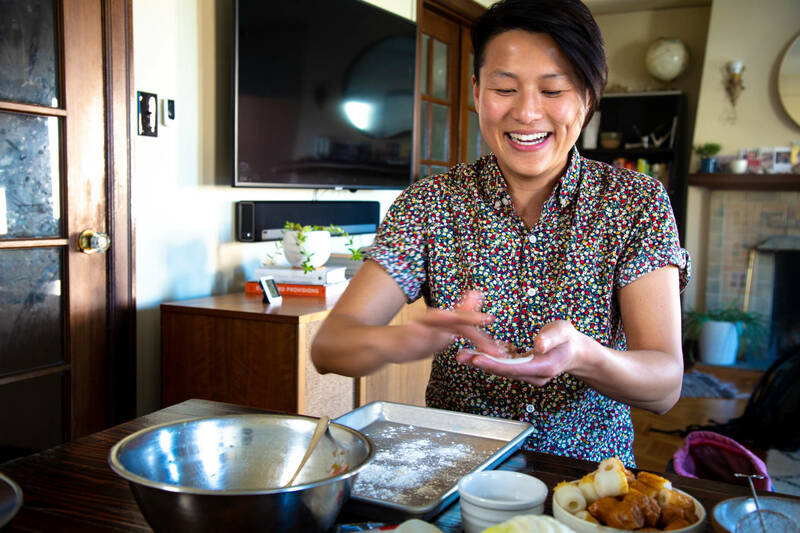 Instead, he and his partner Sam will still celebrate the occasion with their customers and staff by creating a new tradition: baking black sesame cookies paired with red envelopes and having a small party at their showcase location in Berkeley. These traditions were passed down generation to generation, from mothers and fathers to daughters and sons, but, as we leave home and our families, we can still celebrate those ancient traditions while making some new ones along the way. And what better way is there to share knowledge than with food? Place a hot plate or burner in the center of a large table. Place a large pot of broth in the center and bring it to a boil, then to a simmer. Place all the prepared ingredients around the hot pot. Have everyone mix up their own dipping sauces. Each person takes the proteins and vegetables of their choice and adds it to the pot to cook. When each item is done, retrieve it from the broth with a wire skimmer and dip it into your sauce and enjoy. As the liquid evaporates, add boiling water as needed. Rescuing items: it’s ok to rescue something you forgot about, but use your little wire basket to retrieve it, not your chopsticks. Make sure you ask others before claiming something in the pot. Do not cross the dividers and cross contaminate proteins.